This model is has consistent units and has been verified as valid CellML by ValidateCellML. It is currently unsuitably constrained and can not be solved. Pancreatic beta-cells are located in clusters within the pancreas called the islets of Langerhans. Beta-cells secrete the hormone insulin in response to elevated blood glucose levels, and in doing so, they play an essential role in glucose homeostasis. When beta-cells fail to function properly, this can lead to pathologies such as type II diabetes. Slow bursting, which has a period of 2 to 4 minutes and which occurs in single cells and in islets. The first mathematical models of beta-cells were developed to describe medium bursting, and the first models to address the variability in beta-cell oscillations were developed by Chay in 1995 and 1997 (see Extracellular and Intracellular Calcium Effects on Pancreatic Beta Cells, Chay, 1997 for more details). In these models the main mechanism for oscillations was variation in the Ca2+ concentration in the ER, which directly or indirectly modulates one or more Ca2+-dependent channels. In the Bertram and Sherman model described here the authors analyse in detail how the ER exerts its affects using a phantom bursting model (see the figure below). and the ADP to ATP ratio. 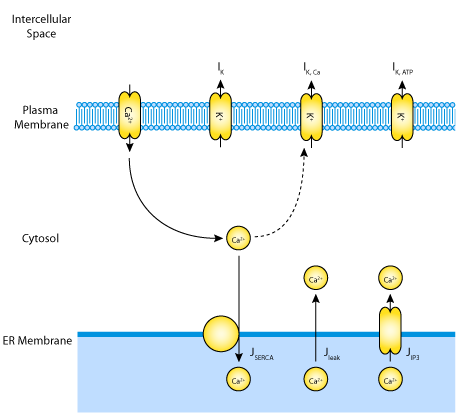 A schematic diagram of the ionic currents and fluxes across the ER and the cell surface membranes, which are described by the mathematical model. Derived from workspace Bertram, Sherman, 2004 at changeset b7eb10424f85.